When your Coveo implementation includes two or more Front-End servers, it makes sense to somehow distribute the users towards the different servers. 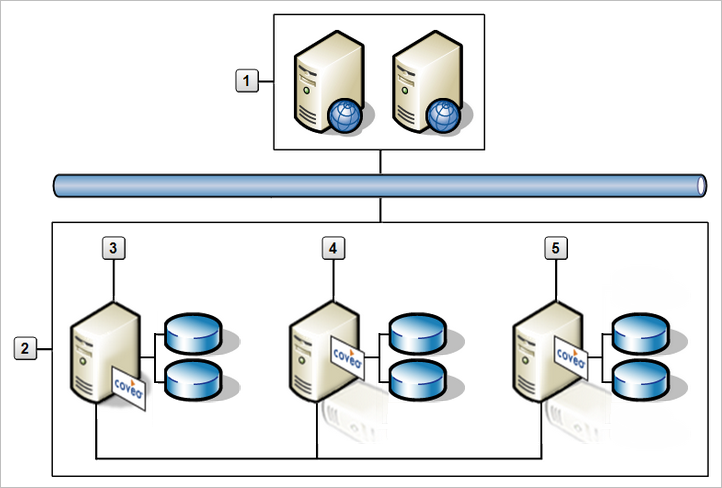 You can simply provide the address of each server only to a specific group of users. A better practice is to define a network load-balancing (NLB) cluster for the Front-End servers, and provide the address of the cluster to all users. The load-balancer transparently and evenly distributes users on the available Front-End servers (see What Is Load-Balancing?). Note: You can use any third-party load-balancer product such as Microsoft Network Load-Balancing (see the Microsoft document Network Load Balancing Deployment Guide). Similarly, when your Coveo implementation includes one or more Mirror servers, you probably want to distribute the query serving load among the Master and the available Mirror servers. Again, you can define a network load-balancing cluster for the Master server and the Mirror servers, and provide the address of the cluster to each Front-End server (see Configuring .NET Front-End Server Query Destination). Network load-balancing optimizes the usage of the Coveo Platform servers. It can also help ensuring high availability and failover capability in the event of planned or unplanned downtime for hardware, operating system, or application maintenance. With NLB clusters, scaling your Coveo implementation is also easier as you can transparently add Front-End or Mirror servers to the appropriate clusters. Tip: When the Master server shows signs of process over load, with two or more Mirror servers, you can exclude the Master server from the NLB cluster to free the Master server from the query serving task. Note: As an alternative solution to NLB, for Back-End servers, you can also consider using the failover alternate server feature (see Configuring a .NET Front-End Server to Use Failover Alternate Back-End Servers). Using a hardware or software load-balancer of your choice, create a NLB cluster that contains all the Coveo Front-End servers. Setup a DNS name that points to this cluster. Provide the Front-End cluster DNS name to your users to access the Coveo search interfaces. Using the hardware or software load balancer of your choice, create a NLB cluster that contains the Coveo Master server and the Mirror servers. Configure each Front-End server to send queries to the Back-End cluster DNS name (see Configuring .NET Front-End Server Query Destination).